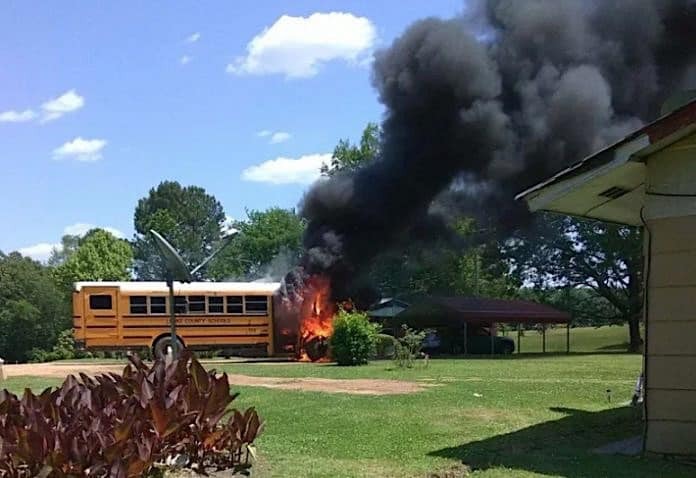 An alert mother noticed smoke and worked with transportation employees to get students evacuated from a special needs bus that quickly burst into flame, reports Mississippi News Now. A Leake County School District bus with nine special needs students aboard was on its regular route on Monday morning. The bus was early to one stop, so a 29-year-old mother, Miesha Ammons, stopped to chat with the driver. While talking, she noticed smoke coming from the bus. Ammons worked with the driver and aide to remove all of the students, none of whom were in wheelchairs, off of the bus. Flames quickly began to spread, and the adults moved the students ever further away. The young mother says she is glad she was there and decided to talk to the driver, or the fire could have started while the bus was on the road. Superintendent Billy Wilbanks later said that the fire may have been caused by a leak in a power steering hose. The district said the bus was a substitute, had been on that route for less than a week, and was found to have no problems during its last inspection on April 2.